12:08 AM Health, Health Benefits, Health care, Home Remedy, Treatment. Ajwain (carum copticum) is a natural herb known as Bishop’s weed or Carom seed. It has Benefit of Ajwain include alleviation of stomach pain, vomiting & pilesa dominant strong flavor and is used in small quantity in food preparations. Ajwain seed is small in size and taste hot and bitter. It is commonly used as a spice in foods. Ajwain are mostly sold and used in seed form and has healing properties that are effective as appetizer and laxative. Benefit of ajwain can be found for ailments including abdominal pain, vomiting, mouth diseases and piles. A natural herb, ajwain is a very popular remedy for many ailments and is known to render quick relief effectively and safely besides being economical. 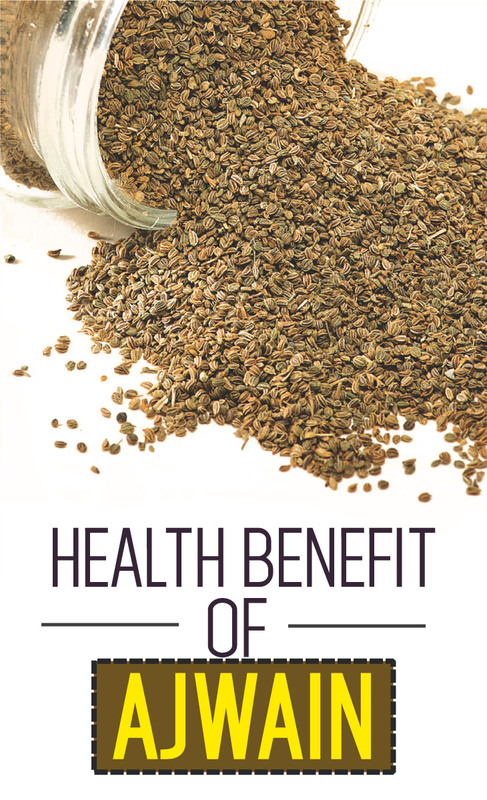 Here is a list of good benefit of ajwain. Ajwain is beneficial for alleviating pains involving the stomach. Pain due to flatulence, indigestion or infection can be relieved on taking one teaspoonful of carom seeds together with two pinches of powdered salt mixed in warm water. For common cold or migraine, tie ajwain seeds or powder in a sparse cloth and inhale frequently. Carom seed is a good digestive agent. Put two tea spoonfuls of carom seeds with buttermilk to decrease digestive problems. If you have asthma, mix Bishop’s weed and jaggery, heat appropriately to make a paste. Consume two teaspoonfuls twice daily. On excessive alcohol consumption, discomfort may develop in your stomach taking Bishop’s weed twice a day can reduce this pain. It also helps reduce any craving or desire for alcohol. Eating one teaspoon of Ajwain mixed in hot water helps stimulate your heart and relieves heartache. Ajwain oil is very effective in reducing ear ache. Drop one or two drops of carom seed oil in your ear at bedtime. To achieve relief from pain of arthritis ajwain oil massage on the legs and knees is very effective. It is also useful in treating rheumatic pain. The smoke from burning Bishop’s weed can effectively relieve your toothache. Another remedy is to gargle with lukewarm water that is prepared on boiling carom seeds mixed with a pinch of salt. Gargle three times daily, it helps relieve tooth pain. Ajwain is also effective cure for cough. Chewing a teaspoon of ajwain and drink some hot water to cure cough. Chew betel leaf with Bishop’s weed before sleeping. It helps control dry cough. Crush a tablespoon of ajwain seed and tie it up in a thin cloth. Inhale it by placing near the pillow while sleeping to relieve nasal congestion. During influenza you should drink water boiled with five grams of carom seeds and three grams of cinnamon bark. Intake this preparation for three days, thrice daily. This helps cure influenza and get relief from its symptoms. Ajwain medicinal uses include alleviation of spasmodic pain in the stomach. Moreover, seeds of ajwain are pale colored and resemble cumin seeds in appearance and have a strong fragrance.